Your resource for all things shoegaze and dream pop: Album Review: Bloody Knives || Death. Reviewed by Dan Joy & partially cross posted from The Active Listener blog. 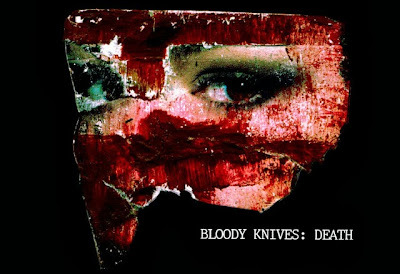 Album Review: Bloody Knives || Death. Reviewed by Dan Joy & partially cross posted from The Active Listener blog. You haven’t heard any music that sounds very much like that of Austin, Texas trio Bloody Knives. At least, I haven’t heard anything—with the exception to some extent of earlier material by the band—that sounds much like the six short tracks on the band’s vinyl-only EP Death, recently released on Saint Marie Records. How often do we honestly get to say that a band or recording is truly that distinctive? This is intense, pummeling, unsettling music, sometimes featuring sharp, startling turns and contrasts. A formidable surge of synthetic industrial sound is underpinned and propelled by classic, riveting punk drumming, with smooth, clear, almost crystalline vocals hovering above. These are components that “shouldn’t” work together and one might almost say couldn’t possibly work together as well as they do here. Find also in this admixture touches of spacerock, a shoegaze appreciation for complexity of texture (the sound is super-fuzzy), dazzling runs of what sound like vintage prog keyboard leads, washes of noise, and a few interludes of abstract ambient beauty. An Austin outlet described the band’s sound as “rock/stoner metal/psychedelic” and the metal connection has come up elsewhere as well, remarkably so given that the band works without guitars. How ever one might identify the various elements, they come together into a unique, eerie, compelling whole that can’t adequately be communicated by summing up its parts.